Does web site speed optimization really work as well as some of us claim? Is it worth all the time and money it takes? In this article I will present a case that demonstrates how one of our clients manage to increase their organic search visibility with 90% just from optimizing the speed of the website according to our specifications. 90% …! Think again. What other single action can you take that will give you such a dramatic increase in search visibility? 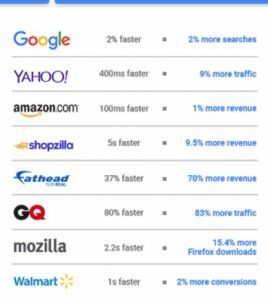 On top of that comes all the other benefits of having a faster website. There are many factors that influence your organic search engine rankings. For most of them you just need to be a little better than your competitors to rank above them. Just a little. If you go crazy with your optimization – especially when it comes to linkbuilding and keywords in content, you may end up with an “over optimization” problem. If for example your competitors get 5-10 new domain links with a decent authority every month you only need 15-20 to slowly gain in on them. If you get 200 (or even more) there is a risk your will stand out as unnatural in your market and in worst case decrease your visibility. But when it comes to web speed optimization there is no such thing as over optimization. I have never met anyone that said: We really love your website but it is just too fast. I just never happen! Google feel the same way. When it comes to the speed of your website there is simply no upper limit. Please go totally crazy with this. 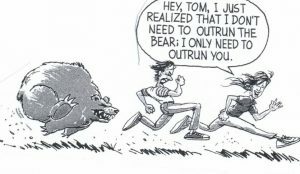 The only thing that may hold you back a little bit is the costs of optimizing the speed. But don’t let that scare you too much. Do as much as you can within the budgets you have. Every millisecond you can increase the speed count. That is exactly what one of our clients did after we pointed out in a 360 degree site assessment that one of their big problems was site speed. The Google PageSpeed Score was in the 50-60 range for most pages. Some of the problems was due to bad image compression but they also had some render blocking issues, general code issues and slow server responses. A website typically consist of several types of pages – a front page, category pages, product pages, articles, blogs and FAQs – just to mention a few. Each page type will usually have some common factors that slow them down, such as server response time, database calls or lack of compression of code. On top of this each individual page – even within the same page type categories, can have individual speed issues. This could be images that is not compressed well enough, design of the page og elements loaded from external sources. Badly compressed images is often one of the single elements that slow down a website the most. If they are not scaled and compressed enough this will have a serious impact on page speed. In the tool below you can test how well your website is optimized for speed – according to Google. Remember to test all your various page types and write down the results for both desktop and mobile. All pages should have a PageSpeed Score of at least 85, or better. If your pages do not score this well then you should read Googles tips below for how to optimize the speed. You are also welcome to contact us if you need help. I have to admit that it is not so often our clients follow our advice as close as it was the case with this particular client. I was actually very impressed with their work when they came back to me, after a couple of weeks after I gave them my advice, and showed me a list of all their most important landing pages that all scored 100 i Google PageSpeed. When I checked how this had impacted their search visibility and traffic I was maybe not surprised – but at least very happy. 90% increase in organic search visibility (according to SearchMetrics) and 75% increase in organic visitors from Google, was the result! Please keep in mind that this is result came just from optimizing the speed of the website. Off course the client have now moved on optimizing other elements – content and authority and I have no doubt that will make the end result even better. Speed optimization works but how much is it worth? When you multiply the increased traffic with the higher conversion rate the result is stunning. I can’t think of any other type of technical optimization that will contribute this much to the bottom line. How much it is worth to you is possible to calculate – or at least estimate. How much would 75% more traffic and 5% better conversion rate do to your business? Once you figure out how much a better website speed could be worth to you compare that to the cost of optimizing the speed. Yes, it can cost a lot to get your website faster, I will admit that, but in all cases I have looked at the value is much higher than the cost. If you need help calculating the cost or the value – or optimizing the speed of your website, please feel free to contact us at (+45) 70 22 80 82 or info@waimea.dk.